Coffee Brewsters is a full service Coffee & Espresso Shop located in the Hoodland shopping center in Welches on your way up to Mt Hood. We serve K&F Coffee, Mighty Leaf Tea, Oregon Chai and Torani Fruit Smoothies. Breakfast and Lunch Sandwiches, Soup and homemade Scones and other sweets. Fully stocked beverage cooler and grab-n-go snacks. Enjoy our Free Wi-Fi. “Where the Mountain gets its Coffee”! At Coffee House 26, we strive to ensure the best customer experience on the mountain by providing the freshest local products at the mountains most comfortable atmosphere. We use 100% locally air roasted coffee and espresso. We serve our delicious food and drinks in an inviting atmosphere at prices that will make you happy.Coffee House 26is a local family owned and operated coffee shop located in the Rendezvous Plaza off of Highway 26 in Welches, OR. We offer free high speed Wi-Fi, seasonal outdoor seating, cold beverages, and delicious Panini and breakfast sandwiches. Whether you are looking for a place to sit and visit with friends, huddle over your computer, or just looking for a quick espresso . . . we are happy to serve you. Come in and visit with us. We are open early at 6 AM on weekdays and 7 AM. on weekends. Please visit our website for full menu. Higher Grounds Coffee is a great place to start your day with quick and friendly service! The Great Blue Lodge is beautiful, spacious and minutes to the lifts, hiking trails and historic downtown Government Camp. Experience the breathtaking views of Mt Hood and Skibowl from this dream of a lodge. Craftsman-style woodwork, granite counters and wood floors provide rustic charm and luxury you desire. Oregon has a proud history of producing great beer, wine, and coffee. At Mt. Hood Roasters we take great pride in adding to the rich culinary contributions Oregonians make to these products. Mt. 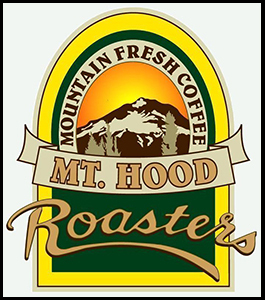 Hood Roasters Coffee Company is a family owned and operated business in Rhododendron, Oregon, in the shadow of majestic Mt. Hood. We air roast our coffee in a Sivetz Fluid Bed Air Roaster and we use only the highest quality, 100% Arabica coffee beans on the market. We roast our coffee in small, 10 pound batches. Crafting exceptional coffee is not just a job to us…it is our passion. If you happen to be in the Mt. Hood area, please stop by and visit our roasting facility. We are the only coffee roasting company in the northwest published in a National Geographic Society Map Guide of places you should visit. We are open to the public 7 days a week. We would love to give you a tour of our facility. Multorpor Lodge Cafe & Espresso Multorpor Lodge Cafe & Espressois located at Skibowl East, this convenient lodge serves luncheon specials including soups, soups and grilled sandwiches, and specialty coffees.